It’s finally happened—some investors verbally committed to giving you money. Now all you have to do is settle on your terms and create bridge note documents, right? Wrong. One huge consideration that most people ignore is how to manage the funding process. Are you going to have all of your investors in one initial closing? Or are you going to use additional rolling closings and take investment in real-time as investors are ready to fund? These are important questions. The way you structure a bridge note financing affects, in part, how fast you can get money in the door, and how much you’ll ultimately be capable of raising. What is a bridge note (aka convertible promissory note)? Here’s an example: An investor loans you $100,000. Later, when you get to your preferred funding (like your Series Seed or Series A), the investor’s $100,000 will convert into preferred stock. Let’s say at the time of the Series Seed funding, shares are selling for $1 per share. The investor put in $100,000, with a 20% discount (kind of like a 20% off coupon), which at $1 per share buys them 125,000 preferred shares (instead of the 100,000 preferred shares a new preferred stock investor would receive). 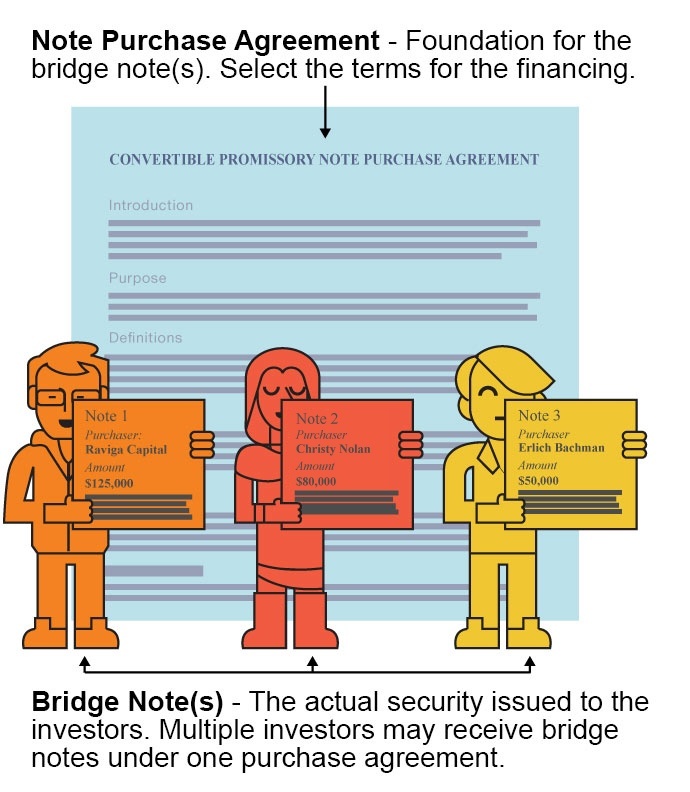 Although the term “bridge note” is generically used to describe a bridge note financing, the actual Bridge Note document is the specific security issued to each investor (for example, to Raviga Capital, or to your wealthy Aunt Christy), which states the interest rate and specific principal amount of the investment. You can have Raviga Capital, Christy, and Erlich as individual purchasers in the same initial closing. In the old days when you’d have to call your law firm and ask them to hand craft the bridge notes, it cost time and energy, so there was a big advantage to having all the investors in the same closing. If Erlich takes forever, or gets cold feet and decides to pull out entirely, your closing is delayed. Timing is everything when it comes to fundraising. Choice 1 is useful if there are dependencies amongst the investors. For example, Raviga Capital, Christy, and Erlich each agree to invest, but only on the condition that the other two investors invest as well. Why would they do that? Maybe each investor is willing to invest $100,000, but they think you’ll never be able to reach your goals without at least $300,000 (perhaps you need a $300,000 proof of concept, without which you'll never meet the next milestone). You can put Raviga Capital as the only investor in the first initial closing, then have Christy as separate additional closing, and Erlich as his own additional closing as well. You can tout the Raviga closing (Raviga being your best anchor investor) with other investors, which may prompt them to get in on the action. After the initial closing, each investor can have their own additional closing. This means as soon as they are ready to wire the money you can close. You don’t have to wait around for Erlich to get back from Hawaii to get your hands on the money that Christy wired weeks ago. Using additional closings means investors who back out or drag their feet won’t slow you down. Done the traditional way, this approach was inefficient and required more time. However, with Shoobx you can do this electronically in seconds with the click of a button. So, no downside there! Keep in mind that you can also take a hybrid approach—for example, you could have several investors together in an initial closing, but also have additional closings, whether they have one, three, or many more investors. The possibilities are endless, but the two choices I’ve outlined above are the two options I see founders choose most often. Shoobx can create bridge notes with any combination of additional closings or multiple people in the same closing. So whatever route you go—choice 1, choice 2, or a hybrid of your own invention—Shoobx can handle it. By creating all of the bridge note documents for you, automating the signature process, and giving investors the details they need to close the transaction—including all-important wire information—Shoobx makes getting those investment dollars in the bank faster than ever before! Interested in learning more about how Shoobx can help you with bridge note closings and other startup legal activity? Click here to get the conversation started.